You are here: Home / What Is Plein Air Painting? The French expression “plein air” means “fresh air” or “in the open air” in English. This is a term used to describe a type of art in which the artist will actually take to the outdoors to paint his/her subject such as a landscape or other outdoor scene. Plein air painting became very popular during the Impressionist movement. Prior to the year 1841, artists were confined to their indoor studios due to the fact the paint tubes and other industrial pigments had not yet been invented. Because the artists needed to mix pigments and oils to create their own fresh paint before each painting session, taking their creativity outdoors was simply not an option. Even before paint tubes revolutionized the way and location where artists could paint, an innovative artist named J.M.W. 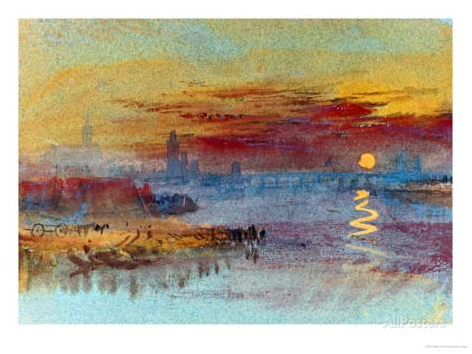 Turner took his work on location by using pencils and watercolor paints instead of oil based paints. Using this medium, Turner created many beautiful works of art that feature seascapes and landscapes. Later, Turner turned some of his watercolor works into oils paintings at his studio. It was a common practice in the early days of Plein Air, for the artist to complete a sketch of their subject matter while outdoors, and then retreat to the studio to complete the work. By the mid-nineteenth century, many schools of art had realized the importance of working in natural light and placing emphasis on the changing qualities of light when outdoors. A main influence on the Realists of the time was the Barbazon school of France. The Realists tended to make everyday subjects the focus of their work. The Realists then became an inspiration to the Impressionists who also worked with ordinary subjects and produced art that showed visible brush strokes and a focus on the use of light. All of this led up to the inspiration for Plein Air painting. As of the 1860’s, the art world only knew the standard practice of creating art in the studio. A few trailblazers such as Pierre-Auguste Renoir, Claude Monet, and Camille Corot made the decision to take their work on site with them by carrying portable easels, canvases, and paints to an outdoor location. This gave the artists the freedom they needed to study and capture the feeling of light in their painting and re-create how the sunlight effected the landscape by observing it firsthand. Eugene Boudin, a mentor on Monet, was important in the development of the Plein Air style and encouraged Monet to paint in the open air and practice loose brushstrokes and work with bright hues. Many more French artists were adopting the Plein Air style of painting, and many chose the beautiful area of Fontainebleau as the backdrop for their masterpieces. By the early 20th century, the influence of the Plein Air style had spread to Russia. Some Russian artists recognized for their works in the artistic style include Vasily Polenov and Konstantin Korovin.Today, Plein Air painting remains a popular artistic style, with more than 500 artists registered as Plein Air artists in the United States alone. Some good examples of Plein Air paintings might include subject matter such as a mountain range, a group of trees in full autumn color, a rocky shoreline, a house and garden, geese sitting by the lake, or children frolicking in the ocean waves. Some famous examples of Plein Art paintings are “Belvedere Lagoon” by Selden Gile, “Niagra Falls III ” by Philip Leslie Hale, and Winslow Homer’s “Road in Nassau”. Artists that create their works in the open air strive to capture exactly what the eye sees when painting their subjects. The artist will observe the location in various weather conditions and at various times of the day to see how the light differs in each situation. These artists much prefer working in natural light conditions instead of in indoor lighting. Common characteristics of Plein Air artists include their use of brilliant colors and the creation of paintings that appear to have a shimmer to them. These artists paint from “real life”, which is both a challenging and rewarding experience.